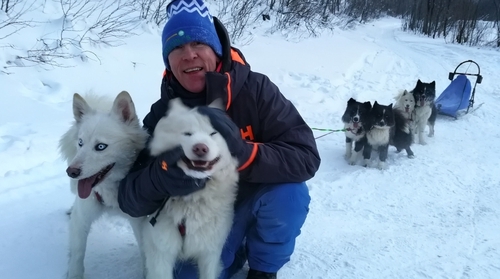 Hector is travelling from Siberia to Saigon in his new series on TG4, while Ear to The Ground is back and tracking the water woes that this country underwent last summer. Plus, Dáithí meets Miss Universe Ireland 2017, Cailín Áine Ní Tóibín. The County Meath legend has indeed travelled far and wide from his native place and Hector is back on our screens beginning his marathon trip in one of the most sparsely populated regions on Earth. At his embarkation point, he is 3,500 kilometres from Moscow, in Siberia. Prisoners were exiled to here to work in salt and gold mines and live in crowded, cramped conditions with poor food. Under Stalin's pitiless regime, such prisoners often perished here, far from home, in the notorious Gulags. But it's not all hardship, by any means. Hector also visits a model agency and watches the ballet, he grits his teeth at the ice swimmers and sleigh dogs who have no problem with temperatures of minus 30 degrees. Lucky divil, he also gets to travel on the Trans-Siberian railway. It is indeed the wonders of television that we know how it will end up, take not this for granted, dear viewer. The publicity informs us that in eight weeks time, having stepped out of Russia, crossed Mongolia and China, entered Nepal and crossed Bangladesh, Burma, Thailand and Cambodia, the bould Hector will conclude his series "sunning himself in Saigon". He will at that point have mastered a journey of over 8,000 kilometres in total. Like I say, a long way from Navan. The fresh and always compelling eco-conscious series returns with new innovations and angles on agriculture and food produce. After the driest summer in 40 years, farmers around the country have had months of coping with a water shortage. Ella McSweeney travelled down to a section of the River Nore in Co Kilkenny to see how dairy farmers handled dry wells and burnt fields. She asks if water is the new quota. Farmers Gerry and James Nolan, a father and son team from Clara, were obliged to draw water from the River Nore and are still struggling with low water pressure. The programme also investigates a new regime of water regulation that will commence this November, governing extraction of water from public waterways. Will these limits on water restrict farmers' production? There are features too on alpacas pressed into service for an interesting purpose involving grass-trimming and a report on the current state of Irish beef. A new short docudrama highlighting the final days of WW1 begins tonight in which we meet the Allied commanders and men in early 1918, at the moment of maximum jeopardy. The Germans have launched a mighty 'shock and awe' attack, advancing more than 60 kilometres in only three days. Standing in their path are British, Australian, Canadian and French forces, while the Americans are still arriving to join the fight. The onslaught triggers a leadership crisis: Field Marshal Haig and Marshal Foch ask Australia's General Monash and Canada's General Currie to develop a new way of waging war. Monash and Currie conclude that the only way to victory is to achieve the 'combined arms' coordination of artillery, tanks, aircraft and infantry on a massive scale. It is the birth of modern warfare. By August, they are ready for what will become a major turning point in the war, the Battle of Amiens. Miss Universe Ireland 2017, Cailín Áine Ní Tóibín is Dáithí Ó Sé's guest this week. Cailín reached the final of Miss Universe in Las Vegas. Cailín Áine recalls the glitz and glamour of competition and as an advocate for mental health awareness she tells how she used the year as Miss Universe Ireland as a platform to highlight the issue of mental health, a challenge she herself encountered as a teenager. Cailín volunteers with Pieta House nowadays and speaks to teenagers in schools regarding mental health.